Opal Sands Resort offers guests the newest Gulf front accommodations on the Gulf of Mexico, right on Clearwater Beach's lively promenade. Guests revel in a grand sense of arrival to a panoramic blue vista which carries throughout the luxurious resort with a fresh, contemporary design, and lively beach-chic atmosphere. All of our beautifully-appointed guest rooms and suites boast floor to ceiling windows with large balconies offering dramatic views of the Gulf and awe-inspiring sunsets. 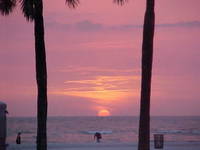 Families and couples enjoy a refreshing blend of casual beachfront luxury and the festive ambiance of Clearwater Beach. Retreat to the powder-white-sands rated by USA Today as the "Best Beach in Florida". Soak up the sun and take a dip in our Gulf front zero-entry outdoor pool and hot tub. Refresh your senses with a day of pampering at our full-service spa. Relish in upscale waterfront dining to handcrafted cocktails beachside at the tiki bar and behold the sun setting into the Gulf of Mexico. With 25,000 square feet of state of the art indoor and outdoor event space with direct Gulf views, Opal Sands is also the perfect setting for meetings, special events, and extravagant weddings. USA Today Rated Clearwater Beach "Best Beach in Florida"
Minutes from Clearwater Marine Aquarium - home of Dolphin Tale's famous Winter and Hope.